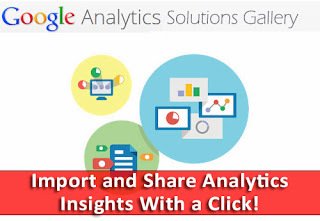 Now You Can Easily Import and Share Analytics Insights With a Click! Google Analytics can be hard to follow, especially for beginners. They simply feel lost in a plethora of so many options and features, and are drowned out by so much information. And it isn't a challenge just for newbies either. Even experienced webmasters can have difficulty navigating through Google Analytics and finding the feature they're looking for. To help users with this problem, the Google Analytics team introduced the Analytics Solution Gallery back in February this year which was a portal of sorts where the Analytics team would upload basic collections of dashboards, reports and segments for users to import and use. Now though, Google Analytics has just made this Gallery public, allowing anyone to contribute their solutions, free for everyone to download them! The Solutions Gallery features solutions that are focused on generating stats and reports dedicated to branding, email marketing and lead generation, eCommerce, and so on. You can think of these solutions as presets in your music player's equalizer. You don't know what the best setting would be for you. So you have some pre-defined presets for you, such as pop, rock, metal etc to help you out and make life easier. The Gallery has nice features that let you see the data you need, or the marketing campaign(s) you want to track, without having to do much work. You can look for an Analytics solution, Business objective, or a Marketing Function. Once you are ready to go with the solution(s) you want to try, you can just download them, and apply to your Google Analytics profile. In addition to opening the platform for public submissions, the Google Analytics team has also worked to integrate the browse, import and share functionality directly into your account via “Share” and “Import” buttons. So whether you are using your favourite dashboard to get a quick view of your site performance or working to set up a new segment, sharing and importing via the Solutions Gallery is just a click away. With this new feature, you can share your Custom Reports, Segments, and Dashboards. Or you can select upto 20 of them (any combination), and put them into a bundle for easier sharing. Often times, you will see bundles instead of individual elements for better coverage of a particular aspect. Once shared, these solutions will be available to everyone, which is another plus-point for beginners or even advanced users who are looking for quick help and solutions. The import process is is a very simple one. All you have to do is, visit the Analytics Solution Gallery, browse for a suitable solution, and click on Import. Then click on a property (site) you want to import the solution into, and you'll be all ready to go. Really Nice Article for the beginners. Nice Info Dude. Nice info bro. I got to know about this service from you. Thanks for sharing. Please read my latest post >>> Embed Google + Post on Blogger Post and please give your opinion how is it coz i am new to blogging . @Qasim Zaib bro: like this blog and all or quality posts form you. Thanks for sharing this New and Nice info.